A type of berry that grows in bunches on vines. There are hundreds of varieties grown in many parts of the world. 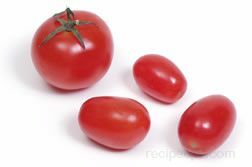 Different varieties have different levels of tartness or sweetness and are generally available in colors such as green, red, purple or black. Grapes can be eaten fresh as table grapes, they can be pressed to produce juice, or dried to become raisins for use as a snack or an ingredient in numerous sweet and savory dishes. Wine is produced through the fermentation of the juice obtained after pressing the grapes. Some of the most popular varieties of grapes are: White (green) seedless - Perlette, Princess, Thompson, or Superior; Red Seedless - Crimson, Flame, Italian Muscat, Majestic, Ruby, Sunset, Emperor (red to purple); Red Seeded - the Red Globe; Black Seedless - the Black Marroo, Ribier, Autumn Royal, or Summer Royal, and the Special types - Concord, Niabelle, Muscadine, Champagne, and Black Corinth. 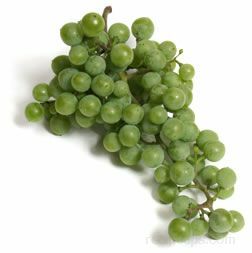 The White Green (Seedless) such as the Princess and Thompson green grapes have a thin skin and provide a sweet, juicy flavor. 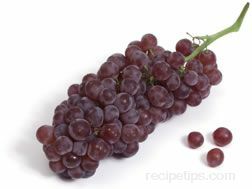 The Flame reds and Red Globe grapes have a soft skin with a flesh that provides a semi-sweet to slightly tart flavor. The Black seedless, such as the Marroo or Ribier grapes have a soft skin and very crisp inner meat that is juicy and has a mellow but sweet flavor. 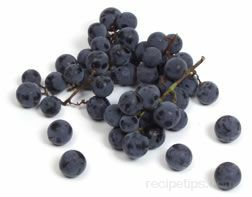 The Concord grape has a thicker skin that covers a jelly-like inner meat that can be squeezed out from the skin. This grape provides a tart taste and a distinctive flavor.